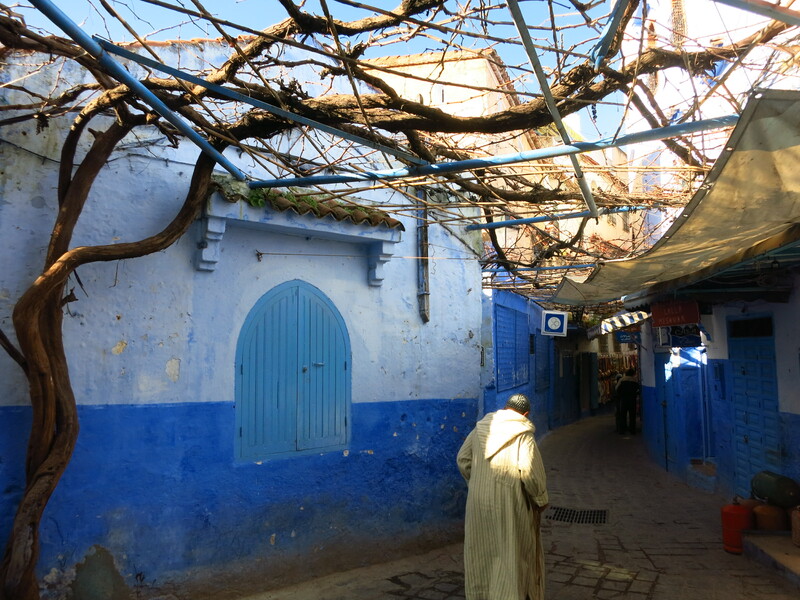 We visited the medina again in the morning to take some picture in daylight – it was an interesting contrast from the previous afternoon. It was early and most shops were still closed or just opening, and the streets were very quiet. 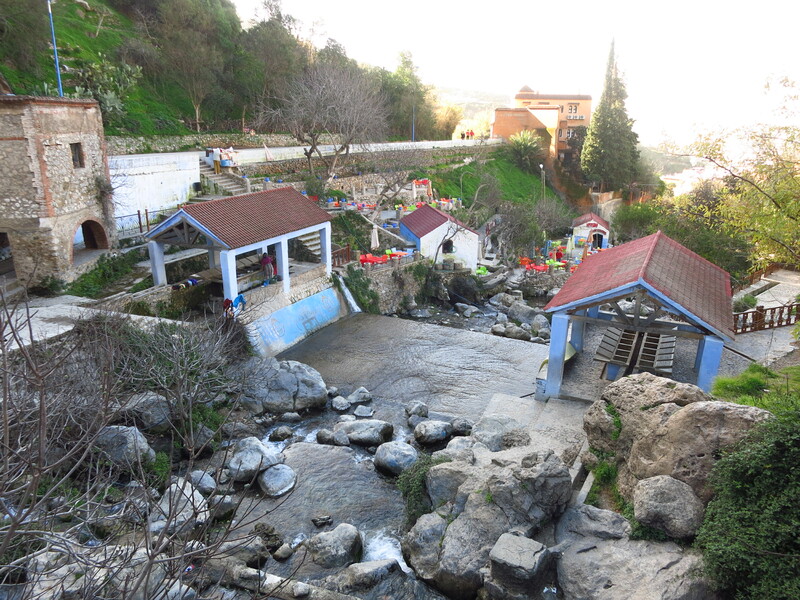 This time we made it all the way across and out the eastern side of the city, where there are some small waterfalls with an ancient system to provide water for the city, a good example of Arabic hydraulic engineering, as well as two public washing places. These facilities are still easy to see in most small villages in Spain, virtually none of them used for their original purpose. They have either fallen into disrepair or been restored as part of the village heritage, but here they were still in use – some women were hand washing blankets, sheets and carpets in the freezing water. Soon after joining the main road to the border with Ceuta we came across some people by the side of the road gesticulating and making open and loud offers to sell ingredients for sandwiches. The day before I had read on some blogs a warning against a common scam – these people offered big quantities of ingredients at a very low price, so a lot of tourists were tempted to buy some, particularly if they were coming into the country and not heading for the border as we were. Shortly after stashing the ingredients in the car and driving off, the seller calls or radioes ahead to a police patrol who are part of the scam and stop the unsuspecting tourist to search their vehicle. They immediately find the ingredients, which are enough to be in serious trouble, even jail time, and demand a bribe in exchange for the victim’s freedom. The tourists usually have to cough up between 300 and 400 euros and then are free to go on about their journey, and the police take the ingredients back to the seller to repeat the scam with the next group of kids looking for the Moroccan experience. At this point, I had completely forgotten about my own ingredients – we wanted to buy very little, only for the previous evening, because we were going to cross the border today and obviously did not want to take the risk, but we had been given enough for several sandwiches, and after the first one we had all gone to bed and not thought about it anymore. Shortly before joining the main road in Tetouan my bike finally fell victim to the roads in Morocco. So far, we had experienced problems with Gerard’s bike – the headlamp and the mudguard issues, and with Esteve’s – his rev counter had decided to recalibrate itself and had been 2,000rpm above where it should be for most of the journey. The country decided that I was not going to leave unscathed, and with only a few kilometres to the border, while riding last in the group, my left mirror came loose. It was waving like a flag in the wind and I could not see the traffic behind me, which is very dangerous in such roads, so I over took the group and we stopped to tighten it. Tetouan took forever to cross, and that was on an avenue that went around the city, we did not even get close to the centre, but heavy traffic and police controls every few hundred metres made for slow progress. We decide to avoid the motorway from there to the border to save some money, as the route along the national road was only a few minutes longer, and the decision gave us some interesting insight into a stark contrast. For most of the last 40km we rode along the coast, going past some of the most expensive looking buildings we had seen in the entire journey. There were beach resort after beach resort on both sides of the road, nothing to do with the run-down buildings just past the border in Melilla, but the strongest contrast was in the hills to our left, beyond the resorts. Somewhere in there, in appalling conditions in makeshift camps, were thousands of people who had made their way north through the continent in hopes of crossing the border into Ceuta and set foot in EU territory in search of a better life. Just a few days before we got here we had read on Spanish newspapers online that a group of over 1,000 of them had attempted to storm the wall that separates Ceuta from Morocco, requiring the intervention of police forces from both sides. Their technique is to make a run for the wall in big numbers, so at least some of them have a chance to make it. It ended with several people wounded on both sides, and only two immigrants made it across the fence, only to end up in hospital from their injuries. In this time of year, at least in Spain, everybody plays the lottery – there is a widespread craze about the Christmas lottery, and people obsess about getting tickets everywhere, victims of a kind of psychological bribery – the ‘what if the prize falls here, or there, or there…’ People buy tickets at work, at their local pub, at their kid’s school, wherever they travel in the days before the holiday, to all kinds of associations and charities… I have long stopped wasting my money on that because I realised that I have already won the biggest price in the lottery of life. As I was riding to the border in Ceuta I thought that I was no different from all the people I had encountered while travelling across less fortunate countries than mine. I could have been born anywhere in the world, but I was incredibly lucky to land in a 1st world country, in a good city and in a great family. We are often unaware of what a huge privilege that is, the reality we live in is not Earth’s reality. We are a very fortunate minority and we forget it too easily. We should all take some time to appreciate what we have. This time the border was a much more organised affair than in Melilla. We still found a lot of guys trying to sell us immigration forms and get some money to help fill them in, but we had all the paperwork we needed and rode straight past the border fence, where, unlike Melilla, they were not allowed, so we enjoyed some peace and quiet while we queued to get our passports stamped and the bikes checked out of the country. We were through in about half an hour, and entering the Spanish side only required showing the passport. It was only at this point that, in a moment of panic, I remembered the ingredients and wondered whether Gerard had taken them with him or left them at the hotel to avoid risking it at the border. Fortunately, nobody seemed to care about a few tired looking guys on motorbikes and we were let through without incident. Tired and looking forward to a shower in the hotel, I forgot to ask him about it again. The following day was the 6th of January, which meant that in the evening there was going to be a big parade on the streets to welcome the Three Wise Men who come from faraway lands to bring presents to the new born baby Jesus or something like that. It turned out that their Majesties had already arrived in Ceuta by mid-afternoon and were staying at our hotel, so when we got there we found a horde of kids and parents taking pictures with them. We left the hotel and went to get some dinner, a few beers (oh, how we had missed them) and a sandwich. It was then, celebrating the end of our journey with a long-awaited beer and sitting at a bar’s terrace overlooking the sea from where we could see the hills around Chefchaouen in the distance, that I asked Gerard about the ingredients. He told me that he had put it inside the little finger of his glove. This entry was posted in Moroccan Christmas 2016, Travel and tagged Border crossing, Ceuta, Chefchaouen, Honda, Morocco by Kilian. Bookmark the permalink.